Martwayne | Power Through Fashion: Pattern Making & Grading with Computer Aided Design Course starts 13 June 2017. Registration has started!!!!! Pattern Making & Grading with Computer Aided Design Course starts 13 June 2017. Registration has started!!!!! And YET another brand spanking new course from us at Martwayne! Yes - this Course I tell you is off the hook! Are you thinking of starting your own ready to wear line in standard sizes?! Well it's time to ditch the manual techniques and go digital with our brand new Course - the Pattern Drafting & Grading with Computer-Aided Design! Just think about it! Cut your production process in half by digitizing your patterns and save yourself the time and energy by cutting out the manual grading and going digital with a computer software! You can easily create several sizes just from one pattern just from a few strokes on your laptop! I tell you this is the new ISH and I am so excited about it! Ok so you know the best ideas stem from some form of frustration right?! Well I can tell you, we got to that stage with the production center. After creating the pattern, Round 2 of the stress comes from grading the patterns, i.e. increasing or reducing the sizes manually. And we thought, if we are facing this problem, other designers must be facing it as well! And I tell you, creating patterns on a laptop is so much fun! Cuts out all the standing and paper and all. And if you make a mistake, simply delete that line! But of course, we cannot totally rule out manual pattern making. Some of us are still old school BUT the best part is, you can digitize your manual patterns and do whatever you want to do to them. And this course teaches you just that! Headache solved from all angles! So How will It Run?! The Part 2 includes both manual grading and digital grading! We split it so participants who want to learn just the manual grading bit can also join us. Well for one I can tell you it will be a packed course. You will learn how to use the software environment, how to draft your blocks using the software, how to digitize patterns, dart manipulation, panels, gathers, pleats, etc and of course grading! And that really is me just giving you a snapshot. Trust me, anyone who registers for our courses can confirm they are packed with information overload! 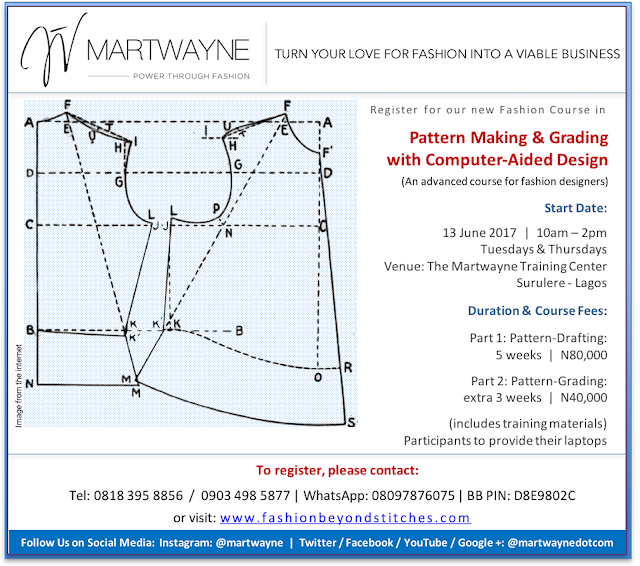 But please note that this Course is only open to those with a prior knowledge of pattern making and it is not a sewing class. Tuesday 13 June 2017 and will run on Tuesdays & Thursdays from 10am - 2pm. Weekend students, not to worry, we promise to come up with a weekend option right after this one so please be patient with us. If you want to learn the manual grading only, this will be N50, 000 and will last 2 weeks. If you want to register for Part 2 only (both the manual and digital grading), that will be N60,000. All fees include the training materials but you need your laptop! Well for one, everyone needs a pattern maker! A perfect pattern begets a perfect outfit! So really with this Course, you can easily create a 2nd income for yourself. And the best part is, going digital opens you up to a global market since customers can outsource their patterns to you to either create from scratch or grade them. You can simply mail the finished result to them without having to bother about mailing pieces of pattern paper and worrying about courier costs. I can tell you that so far, with the factory we set up, communicating and getting the required technical drawings has been a breeze. All the work is done electronically so makes life easier for everyone. So trust me when I say, going digital is really the way to go! As always, registration is as easy as pie! Simply pay the fees in cash or via online transfer into our GTBank account, Martwayne Limited at any Zenith Bank branch. Classes will take place at our Training Center in Surulere, off Alhaji Masha Roundabout. Please feel free to visit us before registering for the Course. We look forward to having you over! Please tell everyone you know who needs this Course. PS. Don't forget about the Corsetry Course also coming up this June. Click here for details.